Vienna, 9 July 2018 - The dramatic state of the 8 European sturgeon species brings together high level experts from the European Union and neighbouring countries in a conference, hosted in the frame of the Austrian EU Presidency and the International Commission for the Protection of the Danube River (ICPDR) on 9 and 10 July 2018. The conference is expected to prompt the much needed cooperation and coordination measures and policies between the sturgeon range states, to protect the critically endangered species. WWF cooperates with the World Sturgeon Conservation Society (WSCS), a global network of sturgeon scientists, to establish a new Pan-European Action Plan for Sturgeons. It will be submitted under the Bern Convention (Convention on the Conservation of European Wildlife and Natural Habitats), and serve as a guiding framework for all sturgeon range states in Europe. At a side event of the conference in Vienna, the draft of this action plan will be discussed and potentially developed further. “Sturgeons have witnessed the rise and fall of European empires, yet have no concept for national borders, which their ancient migration routes cross. They are an excellent symbol for the need of international cooperation – one state cannot protect them without the efforts of its neighbours”, says Beate Striebel, WWF Network Sturgeon Strategy Coordinator. WWF welcomes the leading role of the Austrian EU Presidency to enhance the conservation measures and emphasises the great urgency for their implementation. The EU has already demonstrated that sturgeon protection is a priority by financing two LIFE projects for Danube sturgeons - LIFE Sterlet, led by the Austrian University of Natural Resources and Life Sciences and LIFE for Danube Sturgeons, led by WWF, as well as several other projects for other European sturgeon species. Ensure a full implementation and enforcement of the Water Framework Directive (WFD). Facilitate migration and remove main blockages of migration within the key rivers. The biggest obstacle within the Danube remains the lack of a fish pass at the Iron Gates dams. Protect the existing spawning and feeding habitats from further deterioration and prevent the construction navigation channels or dredging. Andreas Baumueller, head of Natural Resources at WWF European Policy Office, stresses: “Healthy freshwater ecosystems are crucial for sturgeon conservation. However, as the EEA’s 2018 “State of European Waters” report made abundantly clear, governments have so far been failing to protect these valuable habitats, with only 40% of European waters currently considered healthy. If we want to give sturgeon a chance at survival, Member States must now reverse this worrying trend by making the EU Habitats Directive and Water Framework Directive work on the ground." WWF is engaged in sturgeon protection measures in most Danube countries, at the Rhine in the Netherlands, the Vistula in Poland and the Rioni in Georgia. We support the implementation of the Marine Framework Directive, Convention on International Trade in Endangered Species (CITES) or Regional River and Sea Conventions such as the ICPDR or the Mediterranean Sea Convention, as they all are highly relevant for sturgeon conservation. 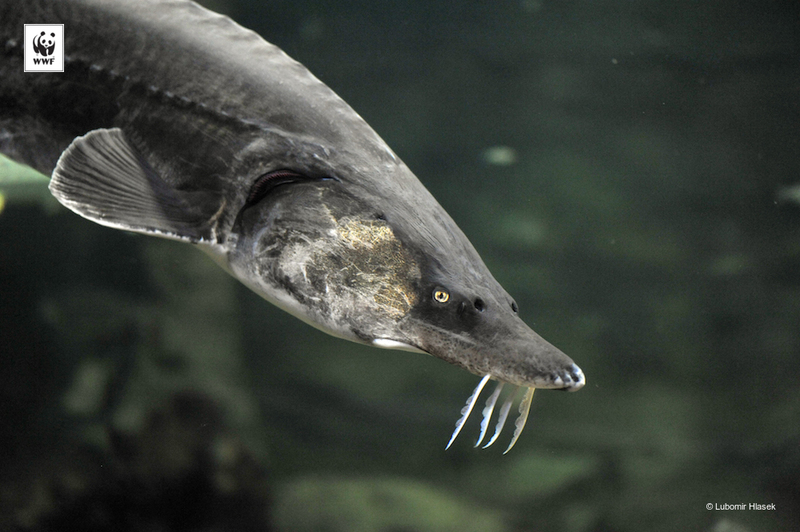 Formerly sturgeons were present in almost all European rivers but today seven out of the eight species of sturgeon are threatened with extinction. The main reasons are overfishing and loss of habitat through dams that block migration routes or in-river constructions, facilitating navigation. These are often detrimental to the feeding and spawning habitats, necessary for sturgeon survival. Within the EU the only river with naturally reproducing sturgeon populations remains the Danube. Crucial but no longer reproducing stocks are left in the Po in Italy and the Gironde in France. Restocking activities take place in France, Germany, Poland, Austria and the Netherlands. Only few rivers remain outside of EU, most important are some Ukrainian and Russian waters and the Rioni in Georgia.